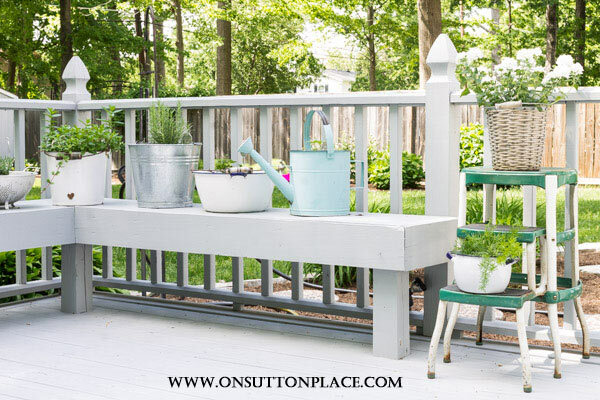 Inspiration for planting a low maintenance vintage container herb garden. 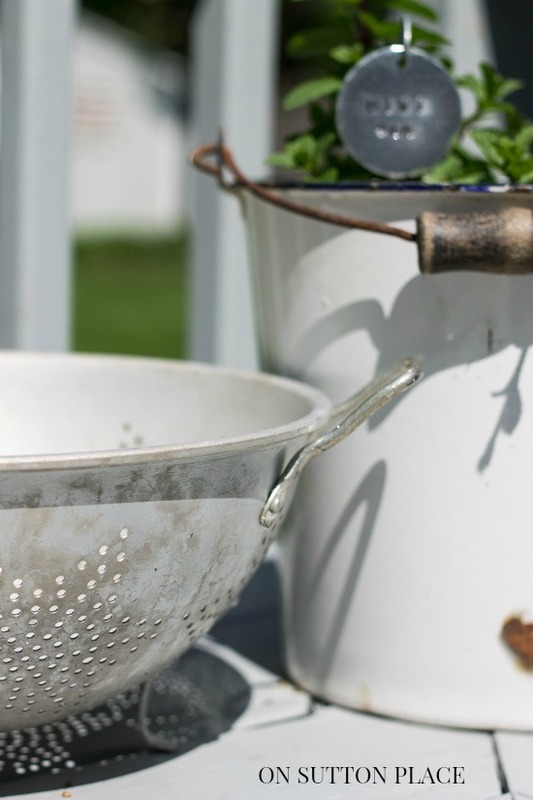 Anything will work from a vintage bucket to an old watering can! 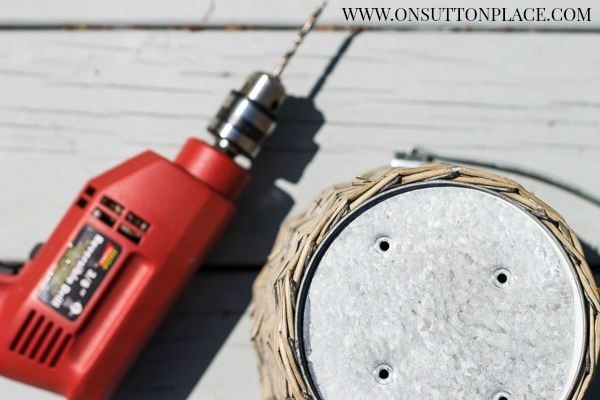 Sometimes DIY projects work out just the way you imagine them in your head…and sometimes they don’t. That’s the story with my vintage container herb garden. It doesn’t look anything like all the pictures I pinned, or the lovely pictures I’ve seen in magazines. It’s a combination of enamelware, galvanized metal and random containers I collected from around the house. It’s completely different from my container herb garden from last year which is what I was going for…I guess. It’s a mismatched collection of buckets and pans that couldn’t have been planned out if I had tried! The first thing I did after gathering my lot of misfits was drill holes in the bottom of each one. This is the most important step in successful container gardening. I had to come to terms with the fact that my vintage enamelware was being permanently transformed into plant pots. Once I did that, I just started drilling. I filled in with verbena and asparagus fern. Even though I had my doubts, this is how it turned out and I have to admit that I sort of like it. I decided at the last minute to use one of the corner benches to stow the containers instead of the deck floor. We have enough seating on the deck and don’t often use the benches anyway. Every container has a little story to go with it. The colander came from my mother-in-law’s kitchen and almost went to the Goodwill. I saved it at the last minute. My plant markers from last year’s garden literally fell apart. 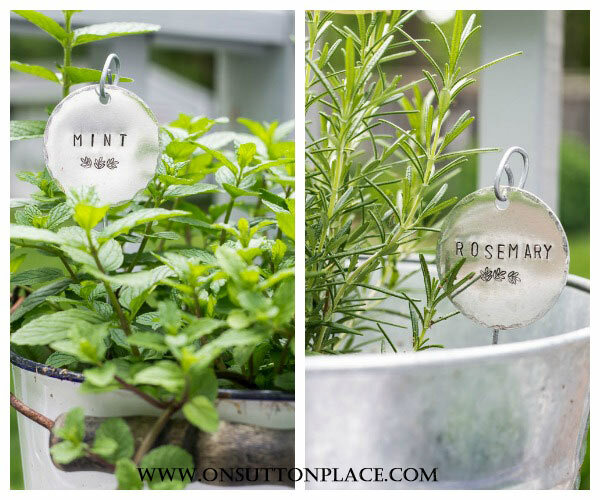 I wasn’t sure if I was going to replace them until I saw these hand-stamped garden markers on Etsy. They are from a shop called Monaco and the owner is from Ohio. I ordered three and liked them so much I ordered three more. They can be ordered in sets or just one at a time. I adore them. I had quite a few questions on the willow buckets. They are no longer available but if I ever find them, I will let you know. If you are new to gardening, or are just obsessed like me, here’s a round-up of my best DIY Gardener’s Tips and Tricks. Like I say in the post, the emphasis is on the DIY. I am not an expert for sure, but over the years I have learned a few things…mostly from all the mistakes I have made! As always, I am grateful you stopped by. Your time is precious and valuable…and I’m so glad you chose to spend some with me. See you soon! Your herb container garden is just gorgeous! I love the simplicity of it all – no real color – but beautiful textures. Thanks for this inspiration! Love your style , and all your tips,keep on posting it is very enjoyable. What a wonderful collection! I like even better than last years – the colours all work so well together. And even though the finishes are different, you’ve created a collection that works. This is just gorgous. And you have me totally inspired to get started already on my own plans for a container herb garden. Thanks! I love using unusual (and cute) containers for gardening. Your herbs look great in them! I’ll have to keep my eye out for cute containers the next time I am out thrift shopping. Thanks for the inspiration. Such cute and clever ideas. I especially love the step stool idea. It brings back memories of my little brother who sat on one as his high chair at the dinner table. Yeah, it was way back! His was yellow. Thanks. So pretty, Ann. I did much the same thing last weekend, collecting and drilling and planting, though I hadn’t thought of buckets, and may just have to plant one up. Be careful of your pretty bench. The water seeping out of the planters will damage the wood. Thank you for coming by Honora! I did think of the water run-off but honestly the benches are on their last leg anyway. The deck is 15 years old and beginning to warp and rot. The containers actually disguise the wear and tear! Enjoy your weekend…hope all is well. What do you use to catch the water runoff from the plants from wrecking your benches. One of the hardest parts of container gardening (for me anyway) is finding saucers to protect the surfaces that the pot sits on that look good with the container. That or finding a container that will hold a saucer and pot concealed within. Hi Peggy! I don’t worry about the water run-off. I use a hose to water the containers and then I spray the bench off well to get rid of dirt and stuff that falls from the trees. Occasionally a squirrel digs in one and makes a mess. Our deck is about 15 years old and the benches are beginning to warp and rot. Putting the herb garden there basically disguised that! Gorgeous! You have me motivated…….. Thanks for an herb-inspiring post! Ann, your herb garden is a lot handier than mine. 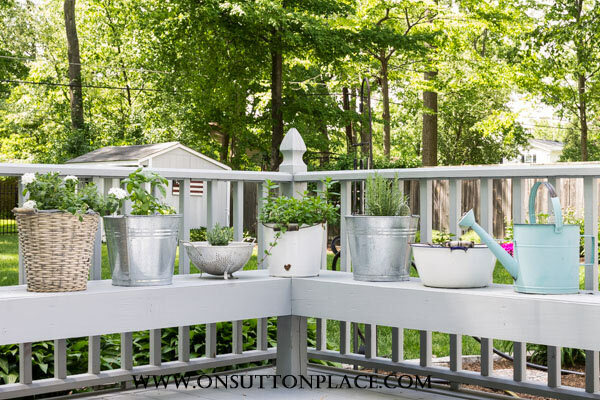 All you have to do is step onto your deck to get your herbs. I have to walk all the way out to the garden to get mine! I like your way much better, and the array of containers is charming! Isn’t chocolate mint divine? Oh Jane you can just send Leo to get your herbs. lol. I have never planted chocolate mint. It was a spur of the moment sort of thing at the farm market when I bought the plants. What do you use it for? Ann, love the markers and love the price! Going to order some for my garden. Great idea and thanks for the reminders that you can use just about anything for a planter or for display! Love these containers and especially the vintage step-stool! Great ideas for planting! I think when the plants grow more & fill in, they will look great!! Love the containers! Great post and thank you since I am just learning too. Your arrangement looks great and the mid-century modern step-stool is too cute and even the color works great. Can’t wait to look at the pinterest you set up. Your post reminded me how many times I’ve photographed some design element in my home so that in the future, I can replicate it. This is especially true of holiday decorating. You arrange something you are really pleased with, and think you will want to do the exact same thing next year. When a particular time of year rolls around again, however, you forget about the past and find that whatever arrangement, design, tableau you are doing right now is just as pleasing to the eye, but in a different way. I believe that is why we like to fluff our nests anyway…for the challenge and the change. Well said Karen and I could not agree more. Without change I think we would all feel very sad and bored! Thanks, Ann! I’ve needed this…I have a raised garden but the darn slugs beat me to the fresh herbs. Maybe if I put my herbs in containers away from where they “hide” I’ll be a successful container gardener. I think I can come to terms with drilling a few holes in some of my vintage containers also! Thanks for “spurring” me on! Yes June just do it. You will love your herbs in containers…promise! Love your container garden…everything looks so pretty…. They look so pretty. When you plant in enamel ware what do you use for drainage ? Ann, I LOVE THEM!!!! I think they look positively beautiful sitting there on your deck benches. (And you know me, I instantly spotted that stool. I am in love with it!!!). I’ve really been enjoying the few herbs I have growing in pots on my porch. I just planted basil, parsley, thyme, and mint. Those are the ones I use all the time so I didn’t plant any others. I love cilantro but it goes to seed so fast that it is frustrating. Anyway, I loved this blog post (as usual) and your pictures are gorgeous. Hi Dori! I know what you mean about planting herbs you don’t use. A few years ago I planted chives and never used them one time! I enjoyed the scent though. lol. I’m not getting your posts by email anymore but I’m following you now on Bloglovin. I hope to be by more often. Enjoy the weekend and tell Andrea I said HI! 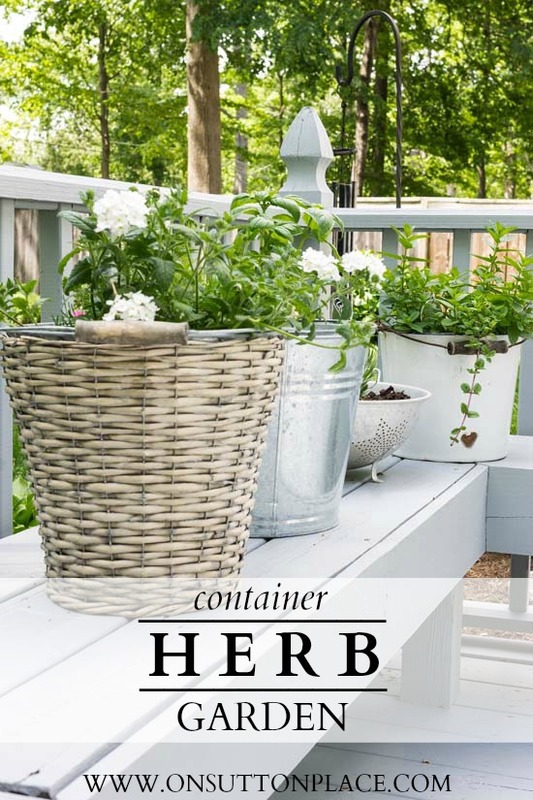 Your container herb garden looks very charming! I think it looks perfect and you will be glad they are in separate containers. My mint likes to take over and I am constantly pulling the strays. Pininng! Ann…I have those same willow buckets and have been using them as outside planters since I got them. They have turned dark, but I kind of like them that way!! Love all the containers and they look great on the bench! Good idea! 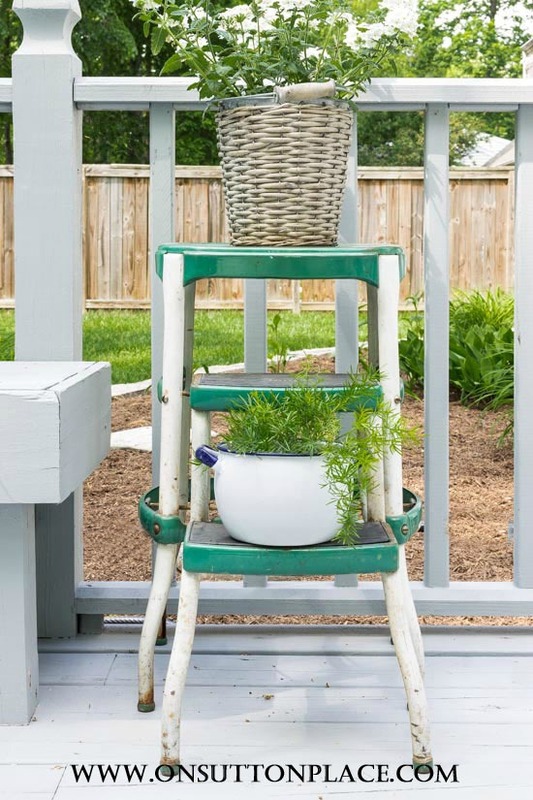 I love your herb garden containers and that old metal step stool is the best! Enjoy! Just placed my markers order. So pleased you shared. I pulled out my blue vintage bowl to plant my chocolate mint and I have two white plant boxes similar to your black ones to house my other herbs. Your post today was extremely helpful. Planting new lavender in a half barrel next. My twelve year old lavender demised at the hands of Ohio winter. Hi Sandy! You will love the markers! My lavender did OK but I lost my big mature boxwood. I don’t know whether to plant more or not…I love to use cuttings inside but if we have another winter like last it seems silly. I’ll wait and see if I can find some on sale. lol. Enjoy your weekend! What a delightful idea, Ann! The fact that the containers are all different makes it absolutely charming. I can’t wait to see how it all looks as the summer progresses! Have a wonderful day! I’m loving container gardening and doing that this year as well. I Adore your vintage containers, Ann! I love it! What a cute look! !